July is a funny month. We begin with festive fireworks and thinking about how our country gained independence. Then, the rest of the month is filled with ways to keep cool in the heat and humidity. With these items in mind, The Hall of Presidents and going under the sea with Ariel seem perfect for the July calendar shots. They are the perfect shots. Happy 4th! Happy Fourth of July- hope you get some time “Under the Sea”! Your pictures are fabulous! The Hall of Presidents is the perfect place to celebrate July! Great shots. Still have not been over to Art of Animation yet. Haha, so true! It is so much fun to kick off July with fireworks and festivities and then at the end we’re busy staying cool! Perfect July shots!! 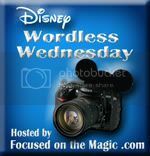 Deb´s last blog post ..Disney Wordless Wednesday Blog Hop ~ Happy 4th of July! Those Ariel shots are great. We will be at Art of Animation in just over a month. We are staying in the Lion King section. Great photos! Happy Fourth to you and yours! Great choices! I hope to get over to Art of Animation to look around sometime!